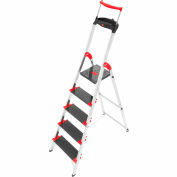 A very stylish aluminum safety ladder with black anodized extra wide 5" treads with red trim and extendable rail for greater stability. Also includes Multi-function tray for paint cans and tools. 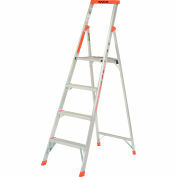 With bucket hook, cable clamp and Aluminum platform with non-slip ribbing and hinge spreader. 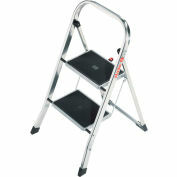 Safe, high-tech riveted rail-step joints. 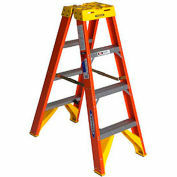 Slip-resistant feet. Maximum load capacity 485 Lbs. EN 131 Certification. Backed by 10 Year Limited Warranty. 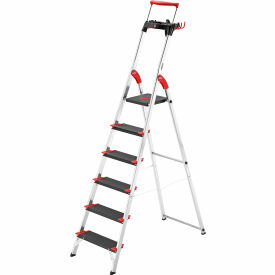 HEIGHT TO TOP STEP/PLATFORM RANGE48"-59"
Pros: Love everything about this ladder- The grip handle at the top-the rubber on the steps-width of the steps-light weight to carry. Cons: None-except that with the 6 steps it is long. 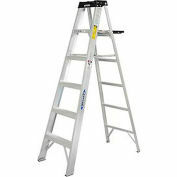 Your review: Comfortable to use and very light o move around. Your review: I was pleasantly surprised. 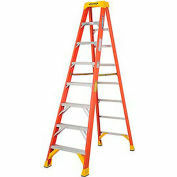 The ladder was exactly what I needed. 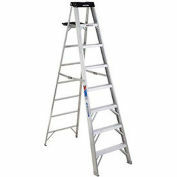 I originally bought this ladder to decorate our 11� Christmas Tree. Talk about comfort, the wide treads are fantastic for your feet, legs and back. 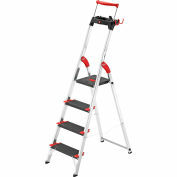 I also like the way that the top step locks together both the front and back of the latter to each other, instead of having locking braces on each side of the ladder like that of a conventional stepladder (you still have to flexible wires in place of the locking braces, but this makes it easy to get the ladder close to the tree). The wire assist in keeping the front railing connected to the back railing. 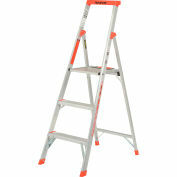 Not only is this ladder comfortable, but lightweight. 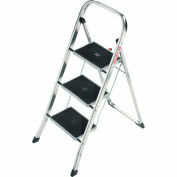 This ladder has many multiple uses both inside and outside home. As for as Safety, I highly recommend it.